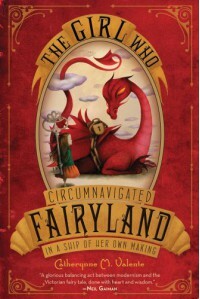 A peculiar and whimsical story hiding within the frames of a traditional fairy-tale and an outrageous fantasy universe. It is filled with wonder and magic; witches, purring leopards, purpose-seeking keys, loyal creatures made out of soap and a dragon with literary roots, all soaked in Valente's beautiful prose and lyrical writing. Nothing makes sense - everything is nonsense, and yet it is the truest book I've ever read. September is a charming, courageous and quirky main character - but of course it was the lovely Wyverary who won my heart in the end. A-through-L is half dragon and half library - with an intense knowledge of everything from A to L. A library-loving dragon in love with alphabetizing - I couldn't have asked for more. Valente's writing is gorgeous - she draws you in with her picturesque and nostalgic descriptions, she stuns you with her vivid imagination of childhood wonders, and she lets you drown in insightful explanations and comparisons. I was at once reminded of Lewis Carroll, Neil Gaiman and C.S. Lewis - some of my favorite writers. Fairyland allowed me to think of talking and living furniture, to imagine flying leopards and wish-granting marids, to speculate of wishes and heartlessness, and it took me on a journey through moonlit valleys of twinkling stars, heartfelt dreams and long-lost fantasies. It filled me with longing, with hope and with bittersweet nostalgia.